Ivan Van Vuuren is a waterman through and through. He is a former professional windsurfer (4x South African Wave champion), surfer , longboarder, kiteboarder and TV host of a weekly extreme sports show “XLTV” that airs in 171 countries. He also has a passion for stand up paddle surfing. We caught up with Ivan as he was moving from South Africa to Maui. SUPGlobal.com: Can you tell us how discovered stand up paddle surfing boarding ? Ivan: I had been living on Maui for 17 years and coming from a surf, windsurf, kite, background when I was first presented with the opportunity in 1994 by Dylan Grafmyre, one of the local Maui watermen, it seemed like the natural progression and supplement to the other watersports we were doing. At that stage there were only a handful of guys starting up so the advantage of paddling to outer reefs with no crowds was an added bonus. SUPGlobal.com: What does it mean to you ? SUPGlobal.com: How have you found the reception to SUP in South Africa ? Ivan: SUP in SA has been overwhelming great. 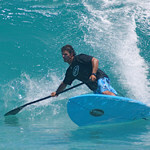 When I arrived here a year ago from Maui to help promote SUP in this country there were maybe 3 guys dabbling in SUP. Within a year we probably have over 400 paddlers and more starting everyday. With the growth obviously comes the concerns from surfers regarding SUP in surf related areas which we are currently dealing with, but all in all totally positive as there are 1000’s of miles of open beaches so plenty of space for everyone. SUPGlobal.com: How are you dealing with the line up issues ? Ivan: We had it in Hawaii when the sport started growing there- I saw it California when SUP kicked in there too. So unfortunately it really is not a geographic or even a specific sport problem. I realize now that as long as you have people in the water, trying to catch waves, the selfish human nature will tend to trigger off, so regardless of what the sport is- whether it’s bodyboarding, waveskis, or different surf riding boards we gonna deal with conflicts. Basically as SUP riders we have to make a conscious effort to be givers, not only takers.- If we have that mindset our time on the water will just be that much more enjoyable regardless of the vibe around us..
As far as how we logistically deal with it- well education is key, for example Coreban have demo and family days where we educate beginners to stay clear of other beach users. For riders that are more experienced to stay to the side of other surf riders and not to be wave hogs or even better to find isolated locations. Similar to windsurfing’s early days it eventually sorts itself out, where different groups migrate to different areas so hopefully as more surfers start to SUP, in time we’ll see less SUP conflicts in the lineups..
SUPGlobal.com: Tell us a little about your company Coreban ? Ivan: Coreban was established in 2005. The word itself means dedicated to God and we figured, what a great name to use for this awesome sport so we came up with the slogan DEDICATED TO THE CORE. Due to my involvement with Premier Productions Hawaii, I have been fortunate to be involved in either testing or filming alongside many of the top brands over the years and in doing this we have been able to see what works and also what doesn’t work for SUP. Over the past few years we have been innovating and testing gear that would essentially work for both the top riders in the world as well as for the general market. The full 2010 Coreban brand will be launched worldwide this year so we are amped to have a brand that is 100% focused on SUP that will help create gear that will take this sport to the next level. SUPGlobal.com: Are we going to be seeing Coreban gear in the UK ? Ivan: Yes we are looking at having Coreban available in the UK by the end of the year. We believe it will be a great addition to the current lines available in the UK as having tested the equipment in conditions similar to what you have there we realize that it will definitely add some “spice” to the local SUP market. SUPGlobal.com: Where do you see the sport developing – more inland flat water, more exploration, or more surfing ? Ivan: These are such early days so as far as equipment goes our designers are continuously shaping and testing new board and paddle designs to see what would be the perfect package for different riding levels. From 7ft wide little strap boards to 16 ft long distance boards, there is so much room for development and improvement. Looking at wave riding boards; as the level rises in the waves, riders will begin to realize how important it is that the brand or board they are riding is designed by a surf designer and not simply a windsurf or kiteboard designer altering templates to make a SUP board. There are so many key factors to making a board that works well in a wide range of surf conditions. And then in racing/ long distance the same applies where we are seeing more input from race designers that have a background in designing race surfskis etc. which will take this whole discipline to the next level. As far as the sport goes in general- the flat-water market is where the masses are so as amazing a shot it is of someone in the barrel in Tahiti, the main market is satisfied with just “standing on water” and riding around with a “surfboard” on their roof so this will open up even greater opportunities for board and paddle developments. SUPGlobal.com : Thank-you Ivan !